Skoda has expanded its flagship Octavia vRS range with the addition of a 4x4 version priced from £27,315 and £28,515 for the estate. Offered with the 2.0 TDI 182bhp diesel engine, the vRS’ four-wheel drive system is coupled to a six-speed direct-shift gearbox (DSG) as standard. From November 1, prices for the Octavia vRS range start from £24,230 for the hatch and £25,430 for the estate, an increase of £400, however, buyers will get the Amundsen satellite navigation system as standard (previously £755), offering a customer saving of £355. Standard equipment also includes 18-inch Gemini anthracite alloy wheels, bi-xenon headlights, sports suspension and dual-zone climate control with humidity sensor. 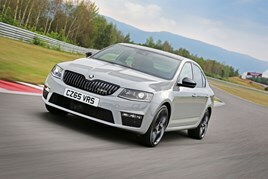 More than 30,000 Octavia vRS models have been sold in the UK since its introduction in 2001.